The polar bear is one of nature’s most formidable creatures. Biologists consider them apex predators: they are the top of their food chains. No creature sees them as prey. Put simply, you don’t want to meet an apex predator on your next camping trip. While the polar bear is king, the walrus isn’t exactly a wimp. Their large size, thick skin, and tusks make them difficult targets even for the mighty polar bears. The walrus outweighs the polar bear and has some aquatic tricks up its sleeve that make it a less appealing dinner than many other arctic creatures. 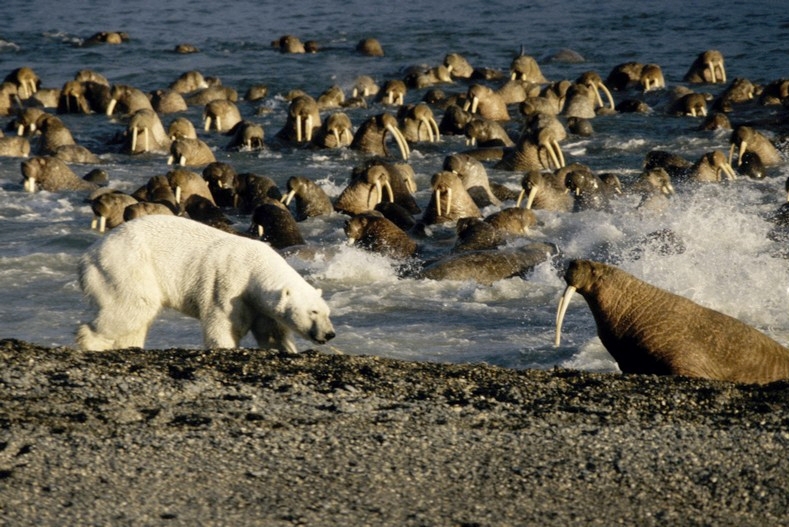 When a polar bear decides that walrus sounds good for lunch, it rarely attacks directly. Instead, it finds a herd of them and charges aggressively. While a polar bear generally wouldn’t win a battle against a pod of walruses, the walrus doesn’t know that. When the bear attacks, the walruses panic, charge, and stampede. Generally some walruses are crushed and wounded as the others escape. I wonder if there isn’t a lesson to be learned here. Did you know that a fire at a movie theater isn’t usually as dangerous as the evacuation to avoid it? Many have been injured in the panic who would have been safe from the fire. The devil likely acts a lot like that polar bear. A Christian’s defensive armor is far stronger than any weapon the devil has to throw at him, so he is reduced to two main tactics: separate him from the herd, or cause the herd to panic and wound him. Can you think of someone who got separated from the body and the devil was able to pull him or her away? Can you think of someone who was hurt by the Christians around him because they were afraid of something else? We don’t always realize that fear and isolation have real consequences. It is no wonder that Peter wrote, “Your adversary the devil prowls around like a roaring lion, seeking someone to devour” (1 Peter 5:8). Maybe he acts like a polar bear, too.